Why would you share the most popular content from high traffic content sites that most people are already reading and sharing? Recently we found a new study released by eMarketer that details the curation sharing from top content sites across the social graph. In one example, Nearly all Upworthy articles go on Facebook. Did you read that? Nearly ALL. With Facebook being the largest social network, it is pretty clear as to why the numbers are skewed heavily in their favor. However, the point is that content from the top sites is being heavily read AND shared by social media users. The top sites garner the largest amount of subscribers, traffic and readers. It is really important to understand the purpose for content curation and the intended effect you should want it to have with your social media audience. It is also imperative that your social media strategy is inline with that desired intent and can be coupled with an efficient set of tools within your social media management. Why Should You Share Content From Lesser Known Sites and Authors? 1) Providing selfless value in your streams – Relevant content that your audience will find interesting. 2) Sparking conversation – If your content is always interesting to your audience and is “off the beaten path” from what everyone else is reading and sharing, it will spark conversation. This can come in many forms, but one way a conversation opportunity arises is through a RT or share of unique content you have curated. Use these opportunities to thank and open a discussion and remember that conversations build relationships. 3) Thought leadership – If you always have unique content in your streams that your peers do not, you will build more thought leadership, faster. The Intended Effect From Content Curation – Unique content curation drives action. 1) Clicks/Views – When the content you share is unique, you will get more clicks and views of what you post. Again, this leads to more repeat and new conversations with your audience. 2) Shares – When the content you curate is unique, more people will Retweet and share your posts. Additional opportunities to engage in conversations and build relationships. 3) Discovery – When you curate unique content that result in more of 1 and 2 above, you will see a rise in the number of people who wish to discover more about you. This will translate into looking at your bio, learning about what you do and clicking to your site, landing pages and content. Social media has a considerable amount of “noise”. 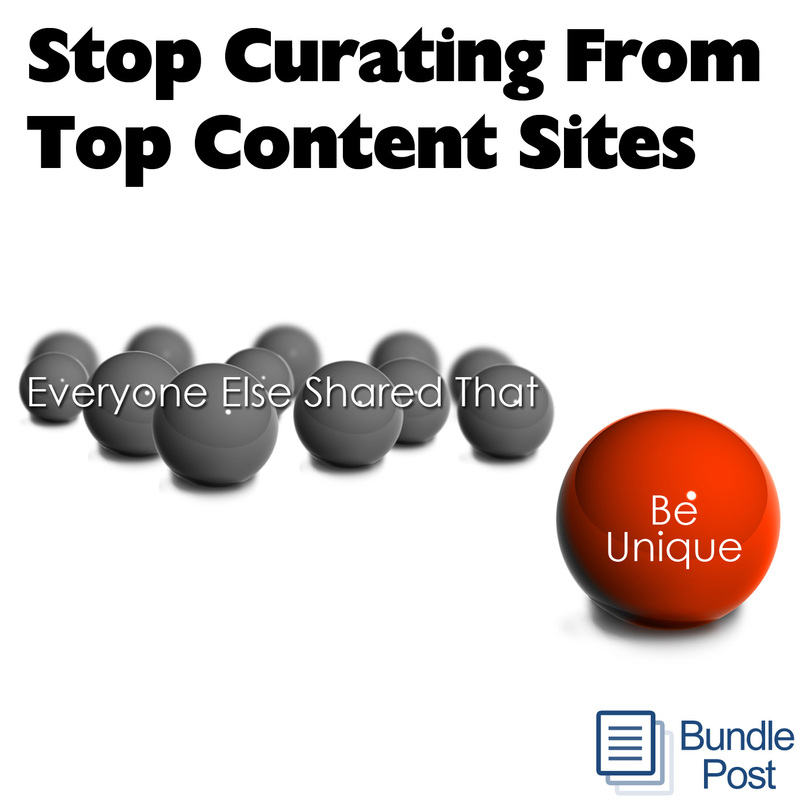 If you are going to be successful using content curation, then you need to be able to cut through the noise effectively. If you are curating the same content everyone else is, from sources that everyone is already reading and sharing themselves, you end up amplifying the noise, not cutting through it. We all want to be unique in life. We all want to display our individualism and be set apart from the crowd. In our real life circumstances this has been ingrained in many of us from a young age. Unfortunately, too many in social media do the exact opposite and are unwilling or thus far unable to spend the time to ensure they are different in this medium. To make matters worse, tools like Hootsuite, Buffer, Klout and many others are now “suggesting” content for you to share. The problem is that they are suggesting POPULAR content based on what everyone else is already reading and sharing, adding more noise to your stream. To be effective with content curation, you need to be both efficient and strategic. These platforms are furthering the problem, not improving the net results. To be clear, I am not saying to NEVER curate content from the top content sites. I’m saying that these sources receive a ton of traffic and social sharing of their content already, therefore making it less effective for your strategy. Be unique. Brilliant post, and I totally agree here. I try to do the same things that you suggest, on my Twitter stream. When I first started curating on Twitter, it was using posts from top content sites. Some of the material got engagement, but the majority didn’t. I think that’s because the information was already well spread out (you opening stats prove this too). What I’ve recently started doing now is to seek out indie bloggers, and lesser known content creators, who produce interesting content. This has helped my engagement. Sometimes I get direct replies from the content creators themselves; and on more than one occasion, I’ve been asked questions about myself, what I do, etc. So, yes, this is a valuable post, and your suggestions work in real life. There’s a brand new Community on Google+ with a charter and focus on Thought Leadership that I just shared this semi-provocative piece. It’ll be interested what the rank `n file has to say about not running w/ the pack and if they intend to kick Forbes, Mash and HuffPost to the curb just yet? We thank you for sharing Neil. It is definitely interesting to hear input on things that make sense. More seriously, great, great post. It’s important to understand that standing out from the crowd has a lot to do with your willingness to walk the path less travelled. Get new posts in your email.